Hmm, I thought to myself as my wife pulled into the parking lot for my first day in the clinical trial for Cytopia (CYT387) at Stanford Medical Center. The buildings in this area look like Quonset huts, not glorious structures endowed by Lucille Packard and those of her ilk. We were looking for building GCRC, whatever that meant. We found it. It was a dinky little structure. We entered. The waiting area was a cramped space with nine chairs packed closely together and carpets that seemed appropriate for a Motel 6. On the wall hung a drawing of the as yet to be developed building to which this project and a number of other projects were slated to be moved—after the building was erected—theoretically a year in the future, realistically meaning three years down the road. I admit it. I’m a snob. I expected to see a glorious building, lush carpets, a concierge taking orders for cappuccinos, and valet parking. After all, this was Stanford, smack in the middle of Palo Alto, the heart of Silicon Valley and home to the rich and famous. Meanwhile, what brought us there was that after eleven years of living with MF and becoming transfusion dependent, my spleen becoming roughly the size of a football field, I had a splenectomy. Of the many consequences of the surgery, quickly my platelets and creatinine came into line with the protocols for admission to the Cytopia clinical trial and after going through various tests, and signing waivers from here to eternity, I was admitted. Thus, we’d arrived at building GCRC for my introduction into the world of clinical trials. OK, so it’s not the Ritz. You’re not here for a vacation. 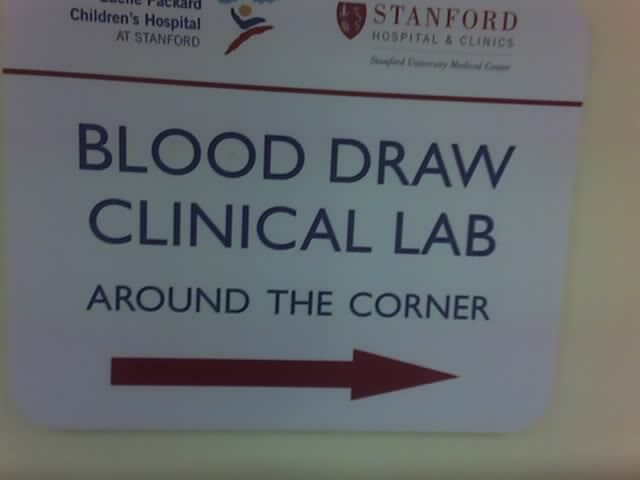 You’re here to take part in a clinical trial. After signing in a receptionist handed us a “parking permit” to place in our car so that it wouldn’t be towed away. We sat and waited to be invited inside. Some in the cramped waiting area had the obvious signs of having an IV line, covered by an expandable cloth. Others pretended to be reading, but looking around nervously every fifteen seconds or so. My wife and I entered. The area behind the secret door was so narrow that if any other person passed you, literally you had to step back to make room. 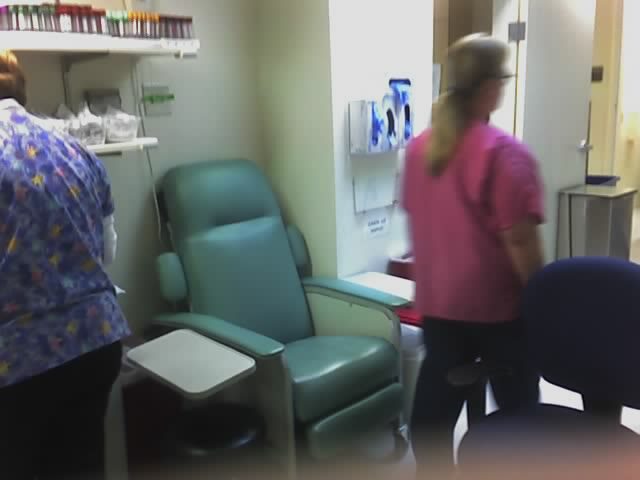 There was a chair jammed in this area for use by patients having blood drawn. (Of course with my luck that wouldn’t do. I’m a “clumper” so I’d have to go to the lab in the main hospital, carrying my urine sample with me, announce that I was a “clumper,”,get a dirty look for the trouble I was causing, and wait until they could get an assistant from the hematology department to join the phlebotomist to process my clumping platelets. Every time I’d go it would be pretty much the same routine. “Are you sure that’s all you need? After a bit more banter, the process proceeded. My wife and I returned to GCRC, me having carried my urine sample to the hospital lab, and now returning with three vials of my blood in a plastic bag. The strange thing is that at a place like Stanford you don’t even get weird stares for what you’re carrying around. After we returned to the cramped GCRC hut we were admitted again to the interior with the three foot hallways. A number of people said, “Excuse me” as we’d back up a pace to make room for some nurse or patient to pass by. Got my vitals taken, reviewed the meds I’d taken in the last twenty four hours, which information is entered into a computer, and was sent to an examining room for an EKG. The room is so tiny that my wife couldn’t sit at the end of the examining table because my feet would have been in her face. She stood in the corner. My EKG was put in an envelope and we were directed to another Quonset hut where I was to be examined by the doctor. We found our way there, entered, and found no one at the reception desk. 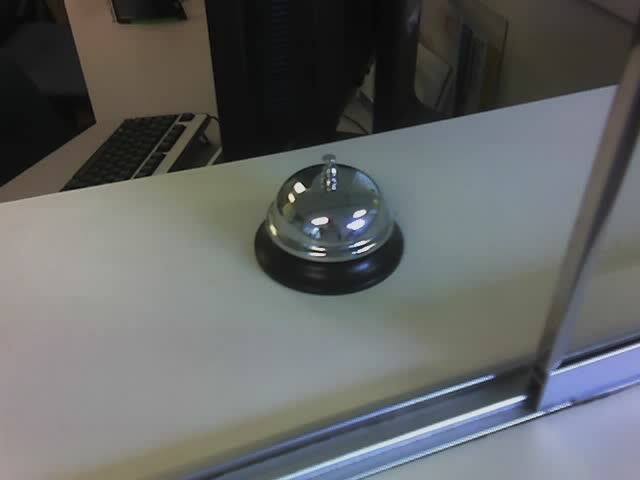 However there was a bell on the counter. I rang. No answer. I rang again. No answer. We sat down. Ten minutes later a person emerged and asked who I was and who we were seeking. We told him. He disappeared. Fifteen minutes later a nurse appeared. We entered a room slightly larger than a postage stamp. The nurse disappeared. She reappeared ten or fifteen minutes later and asked a bunch of questions including my assessment of quality of life which, by that time, had dropped a notch or two. 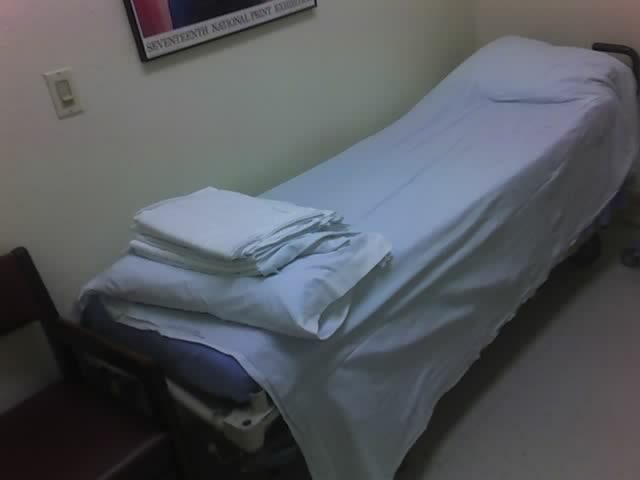 Fifteen minutes later, the doctor entered, gave me a physical and neurological exam. Among other things she asked me to walk heel to toe. Having never been pulled over for a DUI, I first walked on my heels, then on my toes as my wife was cracking up. “What’s wrong?” I asked my wife. I resisted, but stared down at my feet and as I took a few steps, stumbled, a bit like a drunk. “Trust me. Look up,” my wife confidently suggested. I looked up. I didn’t stumble or fall. “Have you ever been pulled over for a DUI?” I asked my wife. After completion of the exam the doctor reviewed with us the lab results, asked for questions, patiently answered them, and had the nurse return with advice on our follow up date. Meanwhile, cramped spaces and all, I’ve come to adore these people. We still have to take a step back to make way for anyone else wanting to pass by, but this is serious business going on here. The nurses and doctors are all dedicated and know exactly what to do and why they’re doing it, and I’ve created a bond with all of them over my now four months into the trial. 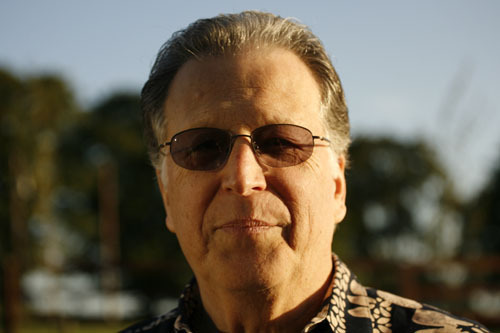 When I developed a critical medical problem that I reported to them, doctor and nurses were in touch with me immediately, ordering medications and tests, urging me to go to ER, and following up with me as though I was one of their children. I’m in the Phase II portion, during which all participants receive the actual pill—no placebos. This drug is for MF patients only. Its primary purposes are to reduce the size of the spleen (irrelevant in my case) and to elevate Hemoglobin. It’s a JAK 2 inhibitor. 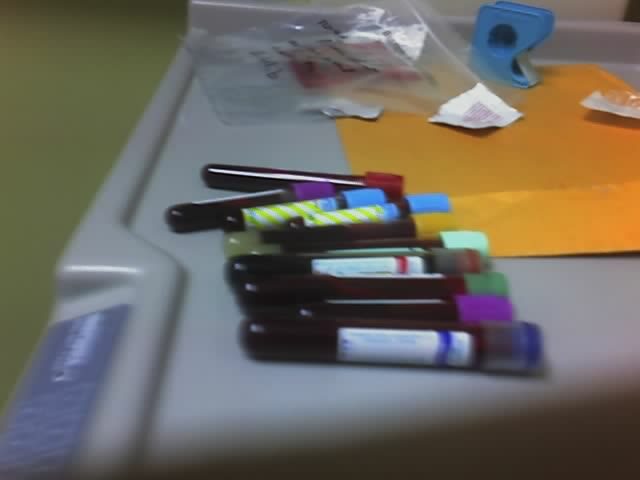 As I understand it, this testing is going on at about five sites worldwide with a total of perhaps 165 to 175 patients. For admission, you must be at the moderate to advanced stage of progression of the disease. I was told at the outset that it was possible that there could be some minor charges as a participant, but I’ve incurred none—so essentially participation is free. You can leave the trial at any time of your choosing; if you remain in the trial and the drug causes no ill side effects and benefits you (it can take from four to ten months to learn if you’re benefiting), you’ll be provided the drug forever, even if the drug never comes to market. Participation is via twenty eight day cycles. Each participant is given a code name so while I’m “Harvey” to those overseeing me, I’m “HLG327” for entry of data. For the first and last day of the first two cycles, you remain in the GCRC Quonset hut for twelve hours and can’t leave the facility at all during that time. They do, however, provide luscious meals in carton containers—either a turkey sandwich with one piece of turkey slapped between two pieces of Wonder Bread, or some other equally delectable choice. But when you’re there for twelve hours, it actually tastes pretty good. Each hour during these twelve hour cycles, vitals and an EKG are taken. Each time you go there after you’ve graduated from the twelve-hour requirement, you have vitals and weight taken, give a urine sample, have blood work done, and an EKG taken—then off to the other cramped space for the exam by the doctor. For the first two cycles you return every week. For the third cycle you return every two weeks. For the fourth cycle you return once a month. From the fifth cycle forward you return every three months. Not including the twelve-hour requirement of the first and second cycles, on average, it takes about a half day for each visit. The medication itself is a 150 mg capsule, the dosing having been determined during Phase I. (Phase III will be with a new batch of patients and will include both the actual medication and a placebo.) You take two capsules a day. The tricky part is that you can’t eat two hours before or one hour after taking the medication and each dose must be taken twelve hours apart. Without boring you with the details, for me the only way it works is to take the medication at noon and midnight—it often proving a challenge to remain awake for the midnight dosing. Still, it’s all well worth the effort if this proves to be of help to those with MF and frankly well worth the effort even if it proves not to be of help because only by trying will we someday reach the goal of more alternatives to minimize symptoms or help science to find the silver bullet of a cure. Questions? Feel free to ask and I’ll be happy to respond.